154 pages | 22 B/W Illus. Design thinking is a powerful process that facilitates understanding and framing of problems, enables creative solutions, and may provide fresh perspectives on our physical and social landscapes. Not just for architects or product developers, design thinking can be applied across many disciplines to solve real-world problems and reconcile dilemmas. It is a tool that may trigger inspiration and the imagination, and lead to innovative ideas that are responsive to the needs and issues of stakeholders. 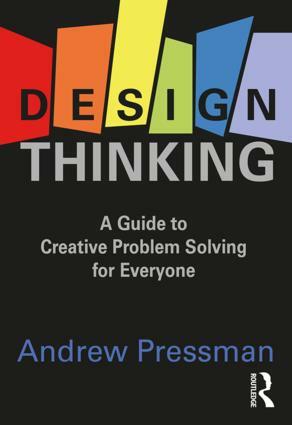 Design Thinking: A Guide to Creative Problem Solving for Everyone will assist in addressing a full spectrum of challenges from the most vexing to the everyday. It renders accessible the creative problem-solving abilities that we all possess by providing a dynamic framework and practical tools for thinking imaginatively and critically. Every aspect of design thinking is explained and analyzed together with insights on navigating through the process. Application of design thinking to help solve myriad problems that are not typically associated with design is illuminated through vignettes drawn from such diverse realms as politics and society, business, health and science, law, and writing. A combination of theory and application makes this volume immediately useful and personally relevant. Andrew Pressman, FAIA, an architect, Professor Emeritus at the University of New Mexico, and Adjunct Professor at the University of Maryland, leads his own award-winning architectural firm in Washington, DC. He has written numerous critically acclaimed books and articles, and he holds a Master’s degree from the Harvard University Graduate School of Design.